GB8SSD qsl infront of Space Shuttle Discovery Thanks to Smithsonian Air and Space! Space Shuttle Discovery soars away from Launch Pad 39A at the Kennedy Space Center, beginning its maiden voyage and a storied spaceflight career that spanned more than 26 years. The on-time liftoff occurred at 8:42 A.M. EDT. 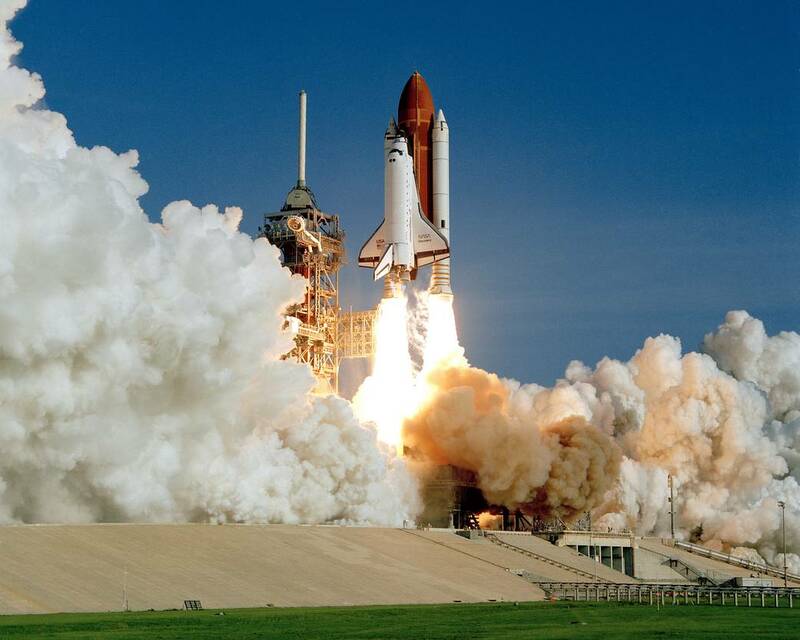 NASA’s Space Shuttle Discovery (Orbital Vehicle-103) took off for the first time on August 30, 1984, beginning what would become 27 years of reliable service. This maiden voyage came more than two months later than planned. It was delayed from its originally scheduled launch date after experiencing the Space Shuttle program's first launch abort at T-6 seconds on June 26, 1984. 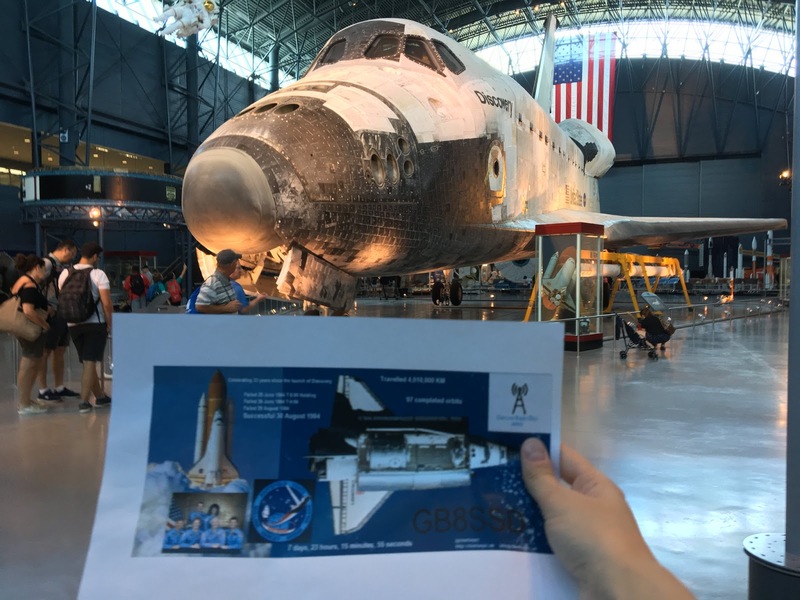 Discovery includes among its many credits the launch of the Hubble Space Telescope, John Glenn’s second flight (when he was 77 years old), and both research and International Space Station assembly missions. Discovery’s last launch was in February 2011, before it was retired in March 2011. 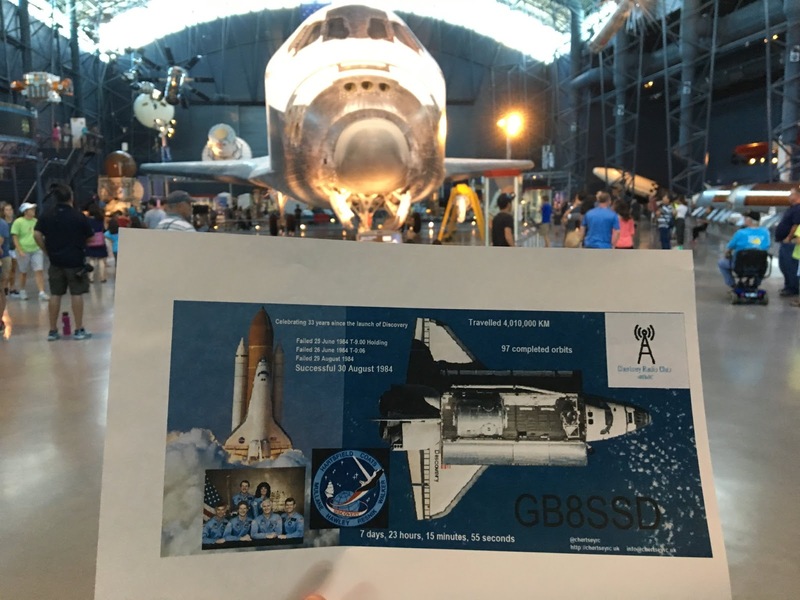 It was the first operational NASA shuttle to be retired, followed by Endeavour and Atlantis. Discovery celebrated its retirement with an April 2012 victory lap where it piggy backed on a modified Boeing 747 to the Smithsonian's National Air and Space Museum in Washington, DC, on its way to be put permanent display. Chertsey Radio club contacted Mike to congratulate him on professional handling of the call / situation and let him know he did an amazing professional job. A credit to himself and the hobby. Wasn't expecting this, So got a little tongue tied! UPDATE: Michaela (May) Has made a full recovery and continues to enjoy her holiday in Exmouth. 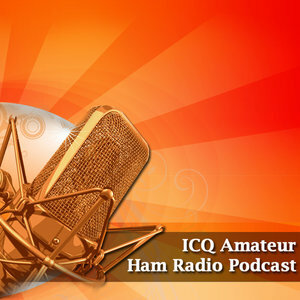 Today we were lucky enough to send voice message via the International space station and talk to other ham radio operators around the world. ISS was 145.800 downlink and 437.050 uplink again today. In the above you can clearly hear 2M0SQL Peter working his magic. Early in July 2017, the International Space Station sent greeting messages in Russian, English, Spanish and Chinese, which were picked up by club members. 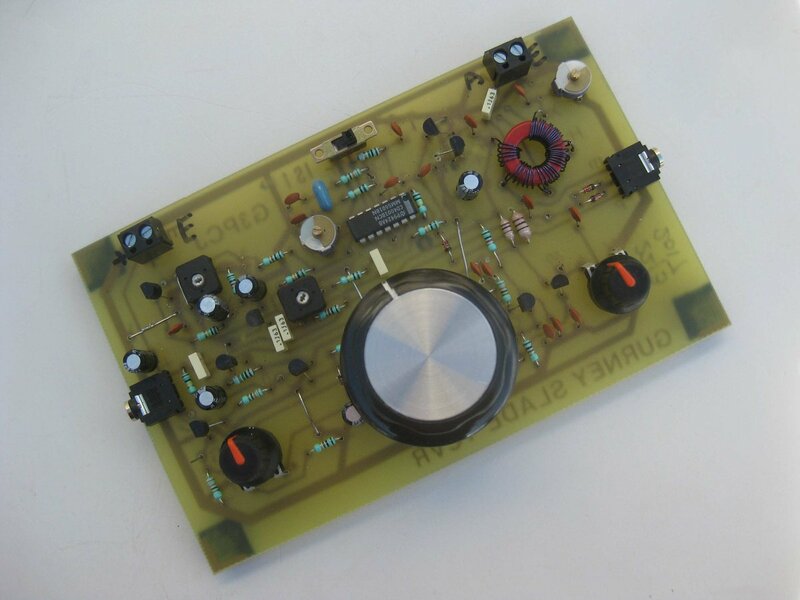 The messages were sent during test transmissions from two small experimental Russian amateur radio satellites, known as Tanusha-1 and Tanusha-2. They will be deployed from the ISS during a spacewalk in August. As part of the celebrations for the 20th Anniversary of Amateur Radio on the International Space Station (ARISS), the ISS sent a set of 12 images using slow scan television (SSTV). The transmissions took place over four days from July 20. Chertsey Radio Club was able to receive the signal and convert them into images using a Raspberry Pi 3. 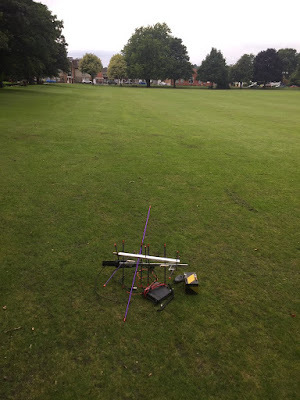 The Surrey press report radio amateurs at the Chertsey Radio Club received test transmissions by two satellites inside the International Space Station (ISS). The club also received ISS Slow Scan Television images. M0JFP's Recording of satellites Tanusha 1 and Tanusha 2 being tested inside the International space station and relayed via the 145.800 onboard radio. M/KG7VZD. Tim Walfords 'Gurney Slade' 80m AM transceiver build is under way. - 003 showing zero. Can we make it? - Isn't it in the way? Looks liek it shouldn't. Signals received from Tanusha on Farnham Web SDR after launch. As part of our summer raffle, we are pleased to announce we have made enough money to purchase the Business Simple UK license for **Project Thomas Watch** today! The license covers several bands and is valid for 5 years. It is our hope that the UK wide license will help enable people on the autistic spectrum and their friends, family and carers (supporters) to allow an additional layer of communication, independence and security, using radios has helped one of our members Son's (Thomas) and given him some freedom to ride his bike around the block, also used on his recent holiday when he wanted to be inside whilst the family wanted to be out (in the sun! ), or when he wanted to go to the toilet, or get food / drink on his own. If you or someone you know is on the Autism spectrum, or could benefit from using our license please do reach out to us we are happy to help talk with you. If you are interested in Project Thomas watch, or at licensing a radio project, please do get in contact with us as we would love to hear from you and may be able to help you out.